Earn SILVER points at these tournaments where all players have less than 300 points! Sunday November 4 and Saturday November 10, participate in a tournaments for novice and intermediate players. You will meet other players who have begun to develop this same extraordinary passion, and all have less than 300 points. All sessions are Duplicata Pairs – 10:00 AND 14:30. These are one-day tournaments. You can play 1 day or 2, 1 or 2 sessions per day. See tournament page for information on stratifications. Come play with your partner. You do not have a partner? You can contact the above mentioned persons, or Christine Bourbeau, responsible for the tournament. You are not a member of the ACBL? Come and participate. However, it is important that you consider the experience gained. Read the following. You are not a member of the ACBL? You are a member but your experience is greater than your ACBL master points allow to see? Read this. 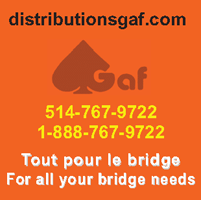 All bridge players are welcome to the tournaments of the Montreal Bridge League. All players must register in the category that corresponds to their real level, whether they play in pairs or teams competitions. The right of a non-member of the ACBL to play in an event restricted by masterpoints is subject to approval by the director of the tournament, to include the player in the right category. Players must register in the stratum equivalent to their experience. A non-member who has attained a status at a given time can not subsequently play in a lower-level category. The tournament director may require a member to be part of a stratum or higher category than his/her number of points, if that member is deemed to have more points. Non-members of the ACBL: they may be beginners with very limited experience or advanced players with a lot of experience. experience gained in other countries. How to determine a number of masterpoints that corresponds to the experience? Assess the number of points that would have been obtained using the experience and frequency of play (eg. 30-50-100 per year). Another method could be to assign a number of points equivalent to those of partners if the level is similar, or adjust accordlingly if the experience is greater (or less). The director of the tournament or the League can help clarify the situation. The successful implementation of the ACBL rules is based on cooperation of all players. Compliance will be appreciated by playing partners and all players. Failing to register in the appropriate category, the concerned pair or team will become ineligible to the overall ranking of the event. © All rights reserved. Montreal Bridge League. Design by Atypic.